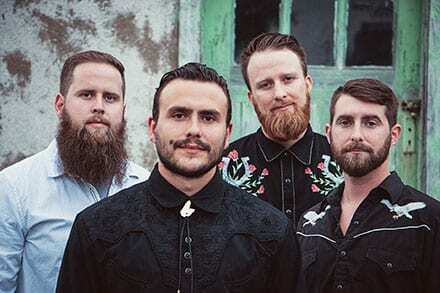 Pretty Archie, a Country/Folk/Bluegrass band from Cape Breton, Nova Scotia, is made up of Brian Cathcart (lead vocals, guitar), Matt McNeil (lead guitar, mandolin), Colin Gillis (harmonica, bass, vocals) and Redmond MacDougall (banjo, percussion, vocals). These long time friends were always jamming together growing up, and in May, 2012, decided to make it official and form a band. The name they chose is based on a local character known for playing with 2 strings outside shopping malls in any weather and not always (or ever) in key. The name “Pretty Archie” embodies their love of playing and performing music, as well as representing their hometown. Pretty Archie’s newest release ‘Sing Alongs & Love Songs,’ released September 2016, and produced by Jamie Foulds, continues to push the genre lines of folk, bluegrass, country and blues, creating a uniquely Pretty Archie sound. A collection of their best songwriting to date, the album addresses themes of love, loss, life and the forces that drive all three. Pretty Archie’s first full length album “Steel City,” was nominated for Music Nova Scotia’s 2013 Country/Bluegrass Album of the Year … recorded at the famed Grant Ave. Studios in Hamilton, Ontario with well known producer/engineer Bob Doidge and available on iTunes. Their highly anticipated second album ‘North End Sky,’ released in January 2015, was nominated for ECMA’s ‘Country Recording of the Year’ and Music Nova Scotia’s Americana/Bluegrass Album of the Year (2015). Pretty Archie have been a showcasing artist at Nova Scotia Music Week, East Coast Music Week, Folk Music Ontario and NXNE and have played some of the best Canadian venues. Pretty Archie’s honest, heartfelt writing connects listeners with a saltwater perspective on modern living. Their fun loving and at times heartbreaking music finds common ground within the blurred genres of country, folk, bluegrass and blues. They are known for their entertaining, high energy, foot stomping shows, and a following that grows after each show they play. Deep Roots look forward to this group’s unique sound captivating this year’s festival audiences.